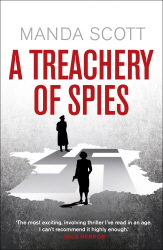 An espionage thriller to rival the very best, a game of cat-and-mouse which will keep you guessing. A body has been found, killed in the manner of traitors to the Resistance in World War Two. To find answers in the present, police inspector Inès Picaut must look to the past . . .
Over the past two decades Manda Scott has brought iconic historical figures back to life, reimagined and re-booted for the twenty-first century. Her crime novels have been shortlisted for many awards including the Orange Prize and an Edgar Award. Her work has been translated into over twenty languages. Densely plotted and populated with characters who are so, so real. A genuinely gut-wrenching whodunnit. A great read. Has you involved from the word go. As with all Manda Scott’s novels her clever and indepth research and empathy for her characters really make them jump off the page and grab you! A work of love and beauty. The best book I’ve read this year. This is a brilliant tale of courage and danger. Intrigue and treachery. I have read so many of Manda’s books. This has to be the most gripping read yet. She is a great storyteller . Tight plot lines and beautiful prose. Stunning work of fiction that keeps the reader gripped throughout. Enthralling like all Manda Scott’s books. Hope you have it with you during the Holiday Season: everybody will want to borrow it! Such a compelling interweaving of time strands, of the implications of personal and social history for the present and of the lives of extraordinary people undertaking extraordinary deeds in dark and dangerous times. Brilliant and so much fun.